Today for Tuesday Tips I would like to talk about toys. The kind of toys that I prefer in our house are the basic, evergreen kind of toys. I like toys that are well made, with a simple concept, that can be used and combined in different ways or played with in different settings. Toys that are beautiful to look at, as opposed to most plastic, brightly coloured and battery-operated toys. I have always had a preference for these kind of toys; I remember telling my mum when I was pregnant with Sara ten years ago to please not give me any battery operated toys! Of course, plastic toys have occasionally entered the house… (and so has Hello Kitty! ), but over the past nine years, I have really noticed that the toys my children play with most (if not exclusively) are those that encourage creative and social play, and are designed with ‘open ended play’ in mind. I just love watching my four kids play together, building houses, cities, and worlds, setting the stage for the different scenarios for their pretend play. I do agree that typical battery operated toys have great appeal to my children at first. They will love the sounds and colours and will be so easily entertained. Often, when the toy is first given to them, they will even fight over it (these toys are designed for the entertainment of the individual child, not with social play in mind!). However, very often my children will quickly lose interest in the toy, which consistently performs the same trick over and over again. So boring! The toy will end up standing in a corner somewhere until we decide to bring it to charity. Such a waste! Heirloom toys are not always the cheapest investments to make, but if you consider that they will be played with so much, for generations even, it’s all worth it. My children still play with some of my own childhood toys! I thought it would be nice to write down a list of some tips for evergreen toys that have proven to be very successful in our household — toys that are played with by children of different ages and don’t lose their appeal, ever. I asked input from Emilie and Courtney and some of my friends, so this is very much their list as well. As always, I would love to hear your thoughts about toys in general, and please do share your children’s favourite toys! Wooden marble track: the perfect toy for all ages. Small children will like to play with the blocks and start stacking them (without the marbles of course), bigger children will build intricate tracks (and parents will gladly help). Building blocks: stacking and building structures, but also great to combine with other toys (f.e. Schleich animals – build compounds, zoo, etc.) or just line them up. Any ordinary blocks will do (we also like this blocks set). Dolls: Kathe Kruse and handmade Waldorf dolls look beautiful, but any good quality doll is fine. And some dolls’ clothes. Doll’s bed: a simple fruit crate with some small towels will do, but a baby needs a bed, of course. A sturdy dolls’ pram with little pillows and blankets. Invest in a good, sturdy dolls buggy and it will be played with forever. Schleich animals: wonderful quality toys, they look beautiful and will be played with a lot. Great for all sorts of adventures. 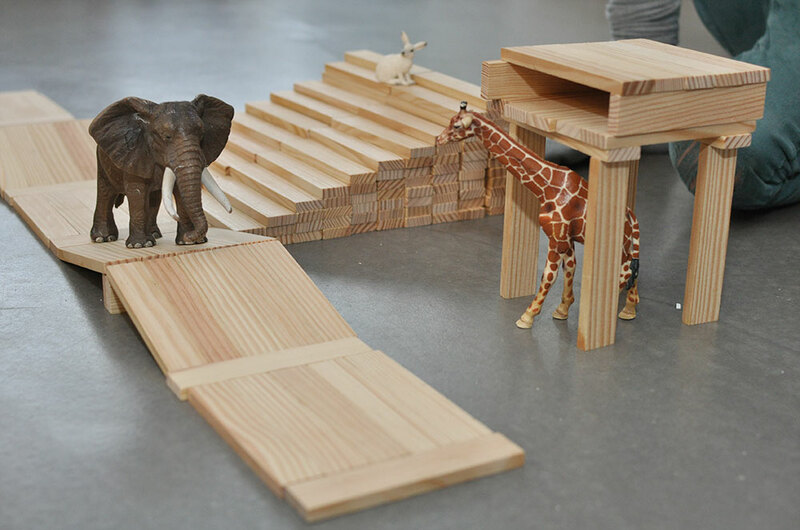 Wooden play barn /house /dollhouse /structure: to combine with Schleich animals, Playmobil, all other little characters that children will find or create and need a place to live. Lego & Duplo: building and inventing, creating. We love the original, plain blocks. Playmobil: we love the old-fashioned characters, great to mix with all sorts of other toys (see above). 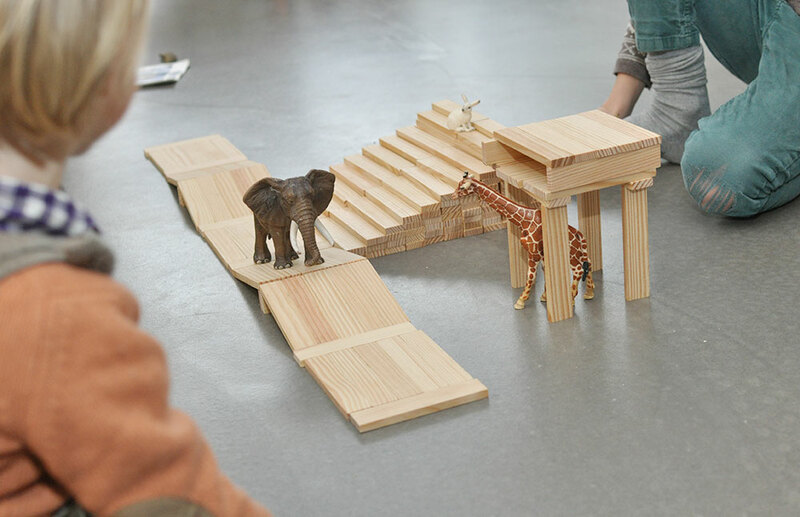 Kapla: some of our favourite blocks for super creative tower-building (see building blocks). Dress up clothes: some old shawls, hats, dresses and sunglasses and some pieces of fabric will get you very far. Let the children be creative – no need to invest in expensive dress-up outfits, which are much less imaginative anyway. Garage and cars: a wooden garage appeals to most children and it a great space to store the cars. Nesting dolls: my kids love these! And they make great decor too. Stacking cups: babies love playing with them, and all my kids still love them in their bath! Wooden spinning tops: fun for everyone and they look pretty on your coffee table. PS Like I mentioned above, these toys are mostly for indoor play — maybe we can share some favourite toys for outdoor play and some great baby toys later. love this, esther!!! so, so helpful. Another great toy (that is currently a family favorite) is a fort building kit. It is made of up sticks and ‘joints’ that allow you to create the framework for blanket tents and forts. Add a dolly in the ‘castle’ for my daughter, stacking cups for my son and turn on some music – we’re in imaginative play heaven! – SIKU cars (1:32 sizing and up). My son loves them and plays with them on a daily basis in the most darling way. The quality is great and they look like the original real life tractors, fire engines, etc. – Big Bobby Car (My three year old lives on it. He now mainly uses it inside, but it got a good use outside as well. – Balance bikes – I just love them, not only because I work with them, but because I saw my son’s development on it. – Crocheted fruit and vegetable in the kitchen, made by my grand-ma. They are not only pretty, but they are being loved by my and all children that come to our house. – Home-made playdoh. The kids help me make it and they play for hours, which I find amazing for a one and three year old. – We currently have a big box in our living room that we turned into a house. The kids love opening the door, climbing in, chatting inside and pretending to clean and to go to work. Through my kids play I realised that they mimic me a lot. It’s funny how you rediscover yourself through your kids 🙂 I tend to ask myself, is that really me and a few moments later I realise, that is indeed me doing it, but I was never aware of it. Fantastic list! My children love many of the same toys…and also Magnatiles. I don’t think a day goes by that those don’t get pulled out to build houses, barns, and other structures for their Schleich animals and Sylvanians. Thank you for the round up Esther. I didn’t know about many of these toys. My son has plenty of battery operated, plastic toys that have mysteriously lost their batteries. I couldn’t take any more of sirens and lion roars and incredibly catchy jingles getting stuck in my head all day. I think the reason he plays with his plastic toys so much is because I normally hide a few toys from him and then reintroduce them every month or so when he’s bored of the current ones (and then those get hidden). But I have to admit that I like the look and educational benefits of simpler, wooden toys and he has a large collection of these. I didn’t see the brand Melissa & Doug on your list so I’ll add these. Their wooden dinosaur puzzle was my son’s favorite for most of last year. Also here in Spain, there are two great stores for shopping for these attractive, educational games. They are: Imaginarium and Eureka. I suppose they have chains all over Europe but perhaps not in the U.S.? Anyway, thanks again! Oh! And my husband emailed me this article and I’m sure you would find it interesting. It’s called, ‘Blocks, Play, Screen Time and the Infant Mind.’ Super fascinating. A lot of creative play happens here as well so old suitcases, baby blankets, pillows, heavy cushions etc are great for moving things around and creating their worlds… It’s fascinating to watch their ideas pan out! I’m new to this site and I must admit I’m loving the content! Oh those alphabet blocks are so pretty! And with regards to the ignorant people… I think it maybe could help if you point them in a certain direction, for instance, tell them you’re collecting Schleich animals, and tell them where they can buy them. (I think in many cases, people actually have no clue what ‘good toys’ are, and where to buy them. I love this post. Thank you for the ideas. I totally agree that open-ended toys are awesome, especially because children of completely different ages will play with them, and in different ways. I love how their creativity comes out with toys like these. We like our Hubelino marble run to complement our Duplo. It makes Duplo interesting again for older children. And the Skip Hop stacking bath toys are a hit in bath! I thought it really encompassed my thoughts on open-ended toys and play. Oh I love that tip Lauren! I’ve already looked online for white silk. Thank you! Great post!! Would LOVE the baby list! I love the old toys. I have an old truck and horse trailer with horses and people. My two year old grand daughter loves them. Hi Esther! What a great post. Thanks for putting together such a concise list. 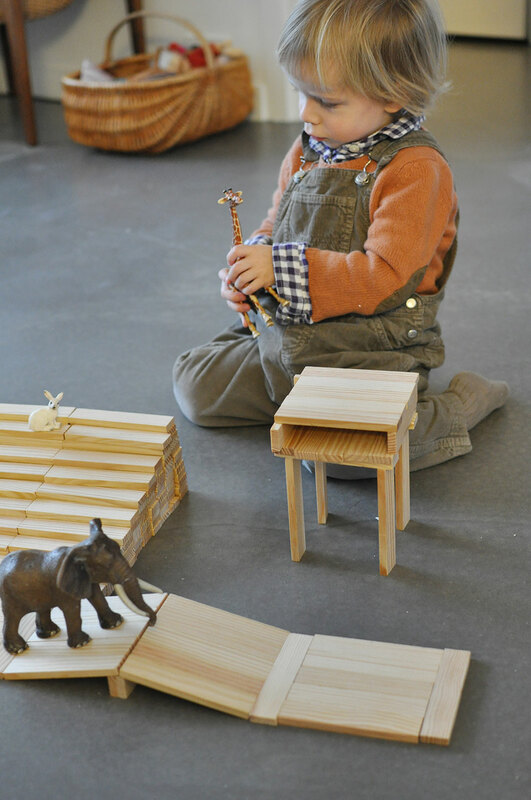 Would you mind sharing what are the wooden toys (the table and the steps) your son is playing with in these pictures?